Objective To compare the diagnostic performance of ultrasound and computed tomography (CT) for detecting pelvic and abdominal tumor spread in women with epithelial ovarian cancer. 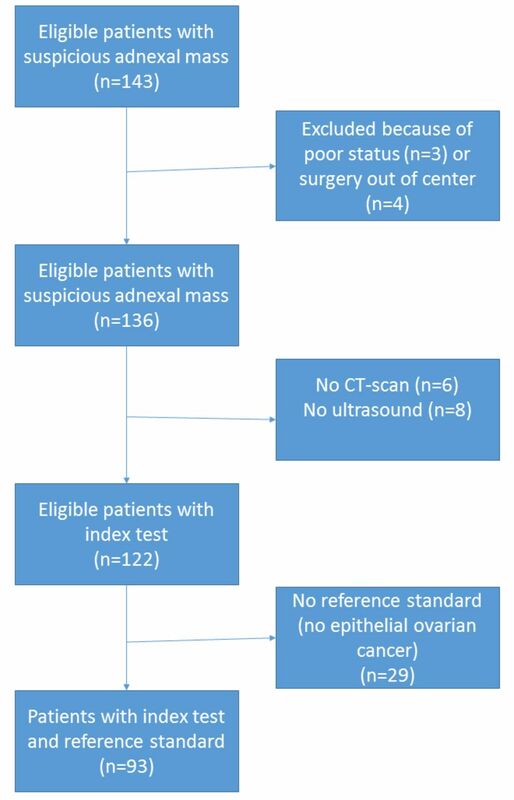 Methods An observational cohort study of 93 patients (mean age 57.6 years) with an ultrasound diagnosis of adnexal mass suspected of malignancy and confirmed histologically as epithelial ovarian cancer was undertaken. In all cases, transvaginal and transabdominal ultrasound as well as CT scans were performed to assess the extent of the disease within the pelvis and abdomen prior to surgery. The exploration was systematic, analyzing 12 anatomical areas. All patients underwent surgical staging and/or cytoreductive surgery with an initial laparoscopy for assessing resectability. The surgical and pathological findings were considered as the 'reference standard'. Sensitivity and specificity of ultrasound and CT scanning were calculated for the different anatomical areas and compared using the McNemar test. Agreement between ultrasound and CT staging and the surgical stage was estimated using the weighted kappa index. Results The tumorous stage was International Federation of Gynecology and Obstetrics (FIGO) stage I in 26 cases, stage II in 11 cases, stage III in 47 cases, and stage IV in nine cases. Excluding stages I and IIA cases (n=30), R0 (no macroscopic residual disease) was achieved in 36 women (62.2%), R1 (macroscopic residual disease <1 cm) was achieved in 13 women (25.0%), and R2 (macroscopic residual disease >1 cm) debulking surgery occurred in three women (5.8%). Eleven patients (11.8%) were considered not suitable for optimal debulking surgery during laparoscopic assessment. Overall sensitivity of ultrasound and CT for detecting disease was 70.3% and 60.1%, respectively, and specificity was 97.8% and 93.7%, respectively. The agreement between radiological stage and surgical stage for ultrasound (kappa index 0.69) and CT (kappa index 0.70) was good for both techniques. Overall accuracy to determine tumor stage was 71% for ultrasound and 75% for CT. Conclusion Detailed ultrasound examination renders a similar diagnostic performance to CT for assessing pelvic/abdominal tumor spread in women with epithelial ovarian cancer. Ultrasound imaging staging is comparable to CT radiological staging in ovarian cancer. Ultrasound could be considered as a reliable technique for assessing abdominal tumor spread in ovarian cancer. Further studies are needed to confirm these data and to determine their generalizability. To date, two studies have specifically assessed the role of ultrasound for assessing intra-abdominal tumor extension in ovarian cancer.14 15 This deserves attention, especially in some clinical settings with lower resources, since ultrasound is more widely available and is cheaper than CT. However, to the best of our knowledge there has been only one study comparing ultrasound and CT for staging ovarian cancer prior to surgery, which found a similar diagnostic performance for both techniques.16 The objective of the present study was to compare the diagnostic performance of ultrasound and CT for detecting pelvic and abdominal tumor spread in women with epithelial ovarian cancer. This is a retrospective cohort study analyzing prospectively collected data performed at a single tertiary care university hospital from January 2012 to December 2017. As this is a study designed for comparing diagnostic techniques, Standards for Reporting Diagnostic Accuracy (STARD) guidelines were used.17 Institutional Review Board approval was obtained prior to the start of the study and all women gave oral informed consent. Eligible subjects were consecutive women with a suspicious adnexal mass as detected by transvaginal ultrasound evaluated at our institution. Surgery scheduled at our institution. Tumor spread assessment by ultrasound and CT. Surgery not performed (poor patient status performance, severe co-morbidities, extra-abdominal disease). Surgery performed out of our institution. CT not performed prior to surgery. Ultrasound not performed by an expert examiner. Final histology of a benign tumor, borderline tumor, non-epithelial ovarian malignancy, or metastatic tumor. All women underwent transvaginal/transrectal and transabdominal ultrasound by one single expert examiner (JLA). This examiner has more than 20 years’ experience in gynecological ultrasound with special interest in gynecologic oncology. He is also gynecologic oncologist staff. This examiner had a specific training period on transabdominal ultrasound prior to the start of the study. Voluson E8 or Voluson E10 machines (GE Healthcare, Milwaukee, USA) equipped with 5–9 MHz and 6–12 MHz endovaginal probes, respectively, and 3.5–7 MHz transabdominal probes were used. All ultrasound scans were performed within 7 days prior to surgery. No preparation (enema or fasting) was done or contrast used. The scanning protocol was systematic and based on methodology proposed by Fischerova.19 We focused on detecting the presence or absence of disease in 12 anatomical areas. The scanning procedure started with a transvaginal/transrectal ultrasound for assessing pelvic structures followed by a transabdominal ultrasound for assessing the mid and upper abdomen. The anatomical areas assessed and ultrasound criteria used for detecting disease are shown in Table 1. Ascites was considered to be present when fluid was detected in any of the abdominal quadrants or in the pelvis (see online supplemental digital content 5). In cases where the ultrasound scan was performed after CT, the sonologist was unaware of the CT findings. For all anatomical areas the examiner had to state whether or not there was involvement. All women underwent thoracic and abdomino-pelvic CT as part of our institution’s protocol pre-operative work-up for women suspected of having ovarian cancer. All CT scans were performed within 2 weeks prior to surgery. The same anatomical areas as for ultrasound were evaluated. Three senior radiologists, all of them experts in women’s imaging, reviewed all CT scans. In all cases, oral and intravenous but not rectal contrast were used as part of a routine protocol in our institution for ovarian cancer evaluation. The examiners had to state whether or not there was involvement for all anatomical areas. Radiologists were unaware of ultrasound findings. The machines used were a Siemens Somaton Sensation 64 and a Siemens Somaton Definition (Siemens Medical Solutions, Förchheim, Germany). A few patients had CT scans performed out of our institution. One of the three radiologists from our institution reviewed these CT images prior to surgery. Patient management was decided during a Tumor Board Meeting. Patients with poor status performance (Eastern Cooperative Oncology Group status 3 or 4), severe co-morbidities or having multiple liver metastases, lung metastasis and/or supraclavicular or mediastinal suspicious lymph nodes were considered as non-operable and were excluded from the study and treated with neoadjuvant chemotherapy after histological diagnosis obtained by ultrasound-guided tru-cut biopsy or paracentesis. CT findings were available to surgeons prior to surgery. Ultrasound findings were not taken into account for clinical decision-making. International Federation of Gynecology and Obstetrics (FIGO) classification was used for staging the tumors.2 Complete cytoreduction (R0) was defined as no macroscopic residual disease. Optimal cytoreduction (R1) was defined as macroscopic residual disease <1 cm. Sub-optimal cytoreduction (R2) was defined as macroscopic residual disease ≥1 cm.20 21 All patients suitable for surgery underwent laparoscopy followed by upfront surgery if the patient was deemed to achieve R1 or R0. Criteria for aborting upfront surgery were miliar carcinomatosis involving extensive areas of bowel serosa, root of mesentery involvement, involvement of the hepatic hilum with lesions larger than 4–5 cm or apparently involving liver vessels, and the presence of gross lymph nodes above the renal vessels. Aortic and pelvic lymphadenectomy was performed for staging in early stages and as a part of cytoreductive surgery in advanced stages in cases of pre-operative imaging suspicion or evidence of gross disease by palpation during surgery. Patients with complete cytoreduction also underwent aortic and pelvic lymph node dissection. Liver metastasis resection was also performed in cases of isolated or single segment metastases. Surgical findings and permanent histological frozen section of excised tissues were used as the reference standard. In cases not debulked, biopsies from all 12 anatomical areas were not always taken and visual inspection and palpation was sufficient. The Kolmogorov–Smirnov test was used for assessing distribution of continuous variables. These variables are presented as mean with SD or median with range as appropriate. Categorical variables are presented as number and percentage. Diagnostic performance for ultrasound and CT was estimated by calculating sensitivity, specificity, positive predictive value, and negative predictive value. Sensitivity and specificity were compared using the McNemar test. Agreement between ultrasound and CT staging and surgical stage was estimated using the weighted kappa index. A kappa value of 0–0.20 indicates poor agreement, 0.21–0.40 fair agreement, 0.41–0.60 moderate agreement, 0.61–0.80 good agreement, and 0.81–1.00 very good agreement.22 The accuracy of both techniques for determining tumor stage was also calculated (correct stage I+correct stage II+correct stage III+correct stage IV/total number of cases). Median body mass index for patients in whom ultrasound or CT staging agreed with the final surgical stage and for those in whom it did not agree was compared using the Mann–Whitney U test. A p value <0.05 was considered statistically significant. Power sample size was not determined prior to the start of the study. During the study period, 143 women were eligible for the present study. Fifty women were excluded for several reasons (Figure 1) and 93 women were ultimately included. Mean (SD) patient age was 57.6 (11.4) years (range 18–84 years). Median body mass index was 24.0 (range 16.7–39.9). One patient (1.1%) was underweight, 51 patients (54.8%) were of normal weight, 28 (30.1%) were overweight, and 13 (14%) were obese. Patient flowchart for this study. Histology was high-grade serous carcinoma in 59 women (63.4%), low-grade serous carcinoma in 13 women (14.0%), endometrioid carcinoma in 13 women (14.0%), clear-cell carcinoma in five women (5.4%), and mucinous carcinoma in three women (3.2%). FIGO tumor stage was as follows: stage IA, n=15 (16.1%); stage IB, n=4 (4.3%); stage IC, n=7 (7.5%); stage IIA, n=4 (4.3%); stage IIB, n=7 (7.5%); stage IIIA, n=1 (1.1%); stage IIIB, n=6 (6.5%); stage IIIC, n=40 (43.0%); stage IVA, n=6 (6.4%); and stage IVB, n=3 (3.2%). According to laparoscopic findings, 11 patients (11.8%) were considered not suitable for optimal debulking surgery and were treated with neoadjuvant chemotherapy. In the 82 remaining patients (after excluding stages I and IIA (n=30), where complete cytoreduction was always accomplished), R0, R1, and R2 debulking surgery was achieved in 36 (62.2%), 13 (25.0%), and three women (5.8%), respectively. These three R2 cases were due to the following reasons: one patient had massive involvement of the greater curvature of the stomach, a second patient had involvement of the left diaphragmatic peritoneum with serious technical difficulties, and a third patient had surgery aborted due to significant bleeding. In all three cases residual macroscopic disease consisted of several nodules larger than 2–3 cm. According to surgical and permanent frozen section findings, ascites was found in 46 women (49.5%); recto-sigmoid involvement was found in 27 women (29.0%); pelvic peritoneum carcinomatosis was found in 59 women (63.4%); major omentum infiltration was found in 46 women (49.5%); upper abdomen peritoneum carcinomatosis was found in 43 women (46.2%); small bowel involvement was found in 12 women (12.4%); root of mesentery involvement was found in four women (4.3%); hepatic hilum was found in 10 women (10.8%); spleen infiltration was found in five women (5.5%); mesogastrium nodules were found in 12 women (12.9%); pelvic lymph node involvement was found in 13 women (14.0%) and para-aortic lymph nodes were found in 18 women (19.4%); and liver parenchyma metastases were found in two patients (2.1%). The diagnostic performance of ultrasound and CT for all anatomical areas evaluated is shown in Table 2. We observed no statistical difference between ultrasound and CT for all anatomical areas. Ultrasound had a slightly better sensitivity for recto-sigmoid, pelvic peritoneum, pelvic lymph nodes, major omentum sites, and for detecting ascites. The sensitivity of ultrasound was worse for assessing small bowel and it was identical for assessing the root of mesentery, mesogastrium, hepatic hilum, liver and spleen parenchyma and for para-aortic lymph nodes. Considering all 12 anatomical areas and ascites in the 93 patients (1209 sites), the overall sensitivity of ultrasound and CT for detecting disease was 70.3% and 60.1%, respectively, and specificity was 97.8% and 93.7%, respectively. We retrospectively calculated that the statistical power of our results at a significance level of 5% was 80.5%, using the number of women included in the study and data from sensitivity (70.3% vs 60.1%). The agreement between radiological stage and surgical stage for ultrasound (kappa 0.69, 95% CI 0.57 to 0.78) and CT (kappa 0.70, 95% CI 0.57 to 0.81) was good for both techniques (Tables 3 and 4). Ultrasound underestimated 10 stage II disease, eight stage III, and seven stage IV, while CT underestimated seven stage II and 11 stage III disease. On the other hand, ultrasound overestimated one stage I and one stage II disease. While CT overestimated one stage I and four stage II disease. Overall accuracy to determine tumor stage was 71% for ultrasound and 75% for CT. Median body mass index in patients in whom ultrasound staging did not agree with the final surgical stage was similar to that in patients in whom ultrasound staging agreed with the final surgical stage (25.2 vs 24.0, p=0.528). Median body mass index in patients in whom CT staging did not agree with the final surgical stage was similar to that in patients in whom ultrasound staging agreed with the final surgical stage (25.1 vs 24.0, p=0.722). In the present study we have compared the diagnostic performance of ultrasound and CT to detect tumor spread in epithelial ovarian cancer. We have found that both techniques have similar diagnostic performance to detect disease in all 12 anatomical areas assessed. We also found that both techniques have a similar accuracy to determine tumor stage by imaging. The main strength of our study is that, to the best of our knowledge, this is the first study that specifically compares the diagnostic performance of both techniques to detect disease in some specific anatomical areas and the second study reported comparing the accuracy of both techniques to determine tumor stage by imaging prior to surgery. Regarding the accuracy of ultrasound for radiological staging, our results are in agreement with those reported by Fischerova et al15 who reported a 75% accuracy (71% in our study). Regarding the accuracy of CT, Moyle et al reported that CT is 70–90% accurate to predict surgical staging.7 Our results are also in agreement with these figures (75% accuracy for CT). More importantly, we found that the accuracy of both methods was similar, confirming the results of the previous study by Kurtz et al,16 who compared the diagnostic performance of ultrasound and CT in 118 women with ovarian malignancy. These authors did not find significant differences between ultrasound and CT for pre-operative radiological staging. The kappa index was 0.66 for ultrasound and 0.65 for CT. Notwithstanding, Kurtz et al grouped anatomical areas in three regions (adnexa, extra-ovarian pelvis and abdomen and beyond) and stages III and IV were grouped in a single category. Regarding the diagnostic performance of ultrasound for detecting disease involving different anatomical areas, we found that ultrasound has a good accuracy for detecting ascites and tumor spread to the major omentum, peritoneal carcinomatosis, and recto-sigmoid, as well as for parenchymal liver metastases. However, its diagnostic performance for detecting disease in other areas, such as root of mesentery or pelvic/para-aortic lymph nodes, is limited in terms of sensitivity but high in terms of specificity. These findings are in agreement with data reported by Testa ﻿et al14 and Fischerova et al15 (see online supplementary table S1). For CT we also found similar results to those reported in previous studies23–25 (see online supplementary table S2). Interestingly, ultrasound—specifically transvaginal ultrasound—showed a rather better diagnostic performance than CT for the assessment of pelvic structures such as the recto-sigmoid and pelvic peritoneum, which is in agreement with findings reported by Fischerova and Cibula.26 In fact, these authors found that ultrasound might be as accurate as magnetic resonance imaging for assessing the pelvis in gynecological cancer. However, our study has limitations. One single examiner performed all the ultrasound examinations while three radiologists read the CT images. This fact is relevant for two reasons. First, inter-observer variability could affect the results for CT whereas this is not the case for ultrasound examination. This might be a potential source of bias that could favor the results for ultrasound. Second, as a single examiner performed all the ultrasound examinations, the generalizability of these results could be questioned. For some anatomical areas the number of cases with true involvement were few (eg, liver or spleen metastases, root of mesentery). Thus, the estimation of diagnostic performance for these areas should be taken with caution. Finally, the power calculation was done retrospectively. As stated above, the generalizability of our results regarding ultrasound might be limited by the fact that a single examiner performed all the examinations. There is still a need to ascertain whether other examiners could replicate these results. Certainly, our results are similar to those reported by Testa et al14 and Fischerova et al15 and it could be inferred that ultrasound might be an adequate technique for assessing tumor spread in ovarian cancer when performed by expert examiners. However, an issue to be assessed in the future is to estimate the learning curve of sonographers/sonologists for this type of ultrasound examination. Our study may have relevant clinical implications since, compared with CT, ultrasound is a real-time examination, is cheaper, does not deliver ionizing radiation, there is no need for either oral or intravenous contrast agent, and could be used in claustrophobic patients. Additionally, the cost of the pre-operative work-up for patients with suspected ovarian cancer might be decreased. This latter issue is certainly relevant for clinical practice in countries with low resources. A clear limitation of ultrasound is the assessment of extra-abdominal disease. We consider that ultrasound cannot compete with CT for assessing thoracic disease. Thoracic CT scanning is needed as part of the pre-operative work-up of patients with suspected ovarian cancer because it is superior to chest X-rays for detecting lung metastases.27 However, according to our results, it may be speculated that a combination of thoracic CT and pelvic/abdominal ultrasound could be part of the work-up in these women. Another significant limitation we have observed for ultrasound and CT is the detection of extensive miliary carcinomatosis and root of mesentery involvement. For this reason, as gynecologic oncologists, we think laparoscopy should be considered as still needed for an adequate evaluation for predicting optimal cytoreduction in women with epithelial ovarian cancer. In conclusion, we have found that a detailed ultrasound examination performed by an expert examiner could render a similar diagnostic performance to CT for assessing pelvic/abdominal tumor spread disease in women with epithelial ovarian cancer. It may be speculated that ultrasound, when performed by an experienced examiner, could replace abdomino-pelvic CT in the pre-operative work-up of women with suspected ovarian cancer. However, our results should be considered as preliminary and further studies are needed to confirm our data.
. Practice Bulletin No. 174: evaluation and management of adnexal masses. Obstet Gynecol 2016;128:e210–e226.
. Surgery in recurrent epithelial ovarian cancer: benefits on survival for patients with residual disease of 0.1-1 cm after secondary cytoreduction. J Surg Oncol 2010;101:244–50. © IGCS and ESGO 2019. No commercial re-use. See rights and permissions. Published by BMJ. Pre-operative evaluation in advanced ovarian cancer: is ultrasound ready to replace computed tomography? Copyright © 2019 BMJ Publishing Group Ltd, International Gynecologic Cancer Society, & European Society of Gynaecological Oncology. All rights reserved.